The Office of the Chief Technologist (OCT) at NASA's Goddard Space Flight Center in Greenbelt, Maryland, has selected Michael Krainak as the FY18 Internal Research and Development (IRAD) Innovator of the Year due to his visionary leadership and skill in applying emerging, potentially revolutionary technologies to a myriad of high-impact, agency-priority spaceflight needs. In addition to Krainak, who heads Goddard's Laser and Electro-Optics Branch, OCT awarded its IRAD team award to Goddard scientists and engineers who successfully conceived, built and launched last year the highly resilient Dellingr CubeSat mission, which is currently gathering scientific data and demonstrating new engineering capabilities. The Dellingr team is using lessons learned to build a more robust platform that can operate beyond low-Earth orbit in a harsher radiation environment. "Mike is an innovator. He sees applications in emerging technologies and then uses his management acumen to not only secure funding to further advance the idea, but also pull together the right mix of people to work on the effort," said Goddard Chief Technologist Peter Hughes, announcing Krainak's selection as Goddard's IRAD Innovator of the Year. "With this choice, we celebrate a rare combination of skills that NASA values — technical acumen, visionary thinking and inspirational leadership. Krainak's successes can affect virtually every area of science and technology. The native of Wheaton, Maryland, and graduate of Catholic University in Washington and Johns Hopkins University in Baltimore, has played an important role in NASA's Laser Communications Relay Demonstration (LCRD) mission, which will show a fully operational laser or optical communications system. He also guided the development of NASA's first low-Earth-user modem, which will fly on the International Space Station and serve as a low-Earth terminal for LCRD. Understanding that optical communications is the future, Krainak directed his organization to develop and demonstrate a low-cost laser communications ground station, with the hope that a commercially available system would lay the foundation for widespread adoption of optical communications. 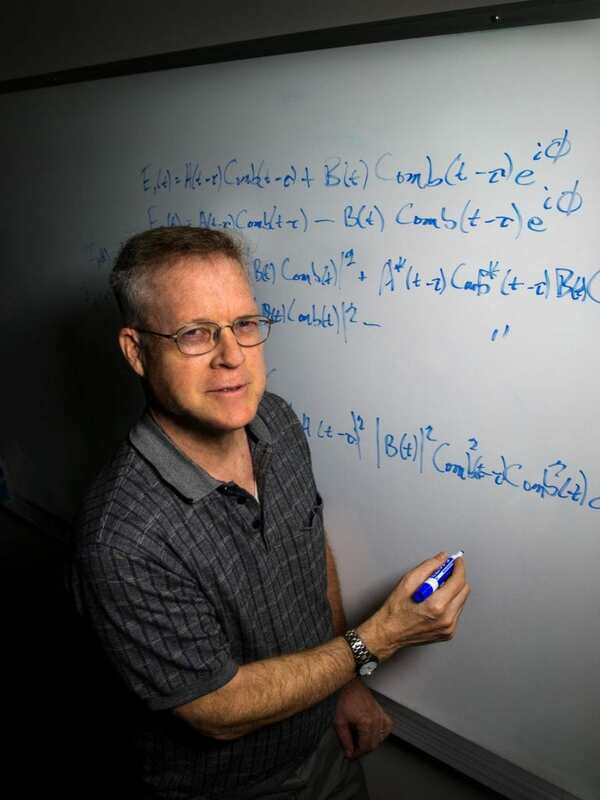 He has since emerged as the agency's expert in photonic integrated chips, which are similar to integrated circuits except they use light rather than electrons to perform a variety of optical functions. His leadership in the field is one of the reasons NASA appointed him as its representative to the American Institute for Manufacturing Integrated Photonics, a non-profit consortium that brings together the nation's leading talent to establish global leadership in the field. As the recipient of multiple patents and author of a prodigious number of technical articles, Krainak has submitted patent applications for a laser crystal that could promote more widespread use of artificial guide stars in ground- and space-based astronomy and laser communications, to name just a few applications. Patents are also pending for an ultra-low-noise laser to detect cosmic gravitational waves as well as for quantum and optical sensors. "These technology developments are groundbreaking and potentially transformational," Hughes said. "I'm awed by the breadth and scope of his technical knowledge and ability to envision how NASA might use emerging technology to bring about breakthrough capabilities. Mike is well overdue for recognition." OCT also awarded its IRAD Team Award to Goddard scientists and engineers who developed the highly resilient Dellingr CubeSat bus and a handful of miniaturized instruments, including an advanced time-of-flight ion-neutral mass spectrometer, two miniaturized magnetometer systems, a release mechanism called DANY, short for Diminutive Assembly for Nanosatellite Deployables, and a miniaturized thermal-control technology. Lessons learned from developing the Dellingr mission contributed to the win of three additional CubeSat missions, including petitSat, GTOSat and BurstCube, and efforts are now underway to create a follow-on SmallSat architecture — DellingrX — which will extend capabilities beyond CubeSats and be capable of operating outside the relatively benign radiation environment found in low-Earth orbit. "When our team began developing Dellingr about four years ago, the goal was to build a relatively inexpensive and more reliable CubeSat platform. The goal was to advance the state of the art in small-satellite capabilities," said Hughes, explaining his organization's decision to recognize the Dellingr team. "Despite a tight budget and aggressive schedule, this team accomplished this and more. The team inaugurated a new era for scientists wanting to use small, highly resilient satellites to carry out important, and in some cases, never-before-tried science."